First opened 1997 with construction financed primarily from state government bond issue and foundation, corporate and private contributions. Primary New Jersey performing arts center, hosted over 10 million visitors since opening, voted in 2016 for 8th consecutive year in annual NewJerseyArts.com People's Choice survey as "Favorite Large Performing Arts Center." Comprised of 2,800-seat Prudential Hall; 514-seat Victoria Theatre; 350-seat Chase Room; and 88-seat Horizon Theater. One of largest arts education programs offered by a performing arts center in US, includes arts training classes, scholarships, in-school residencies, professional development, and family and children's programming in performing arts, painting and poetry. First opened 1925 after building by Shriners as Salaam Temple and colloquially known as The Mosque, renamed Newark Symphony Hall in 1964. Neo-classical design features Greek and Egyptian elements, marble columns, gold-leaf. 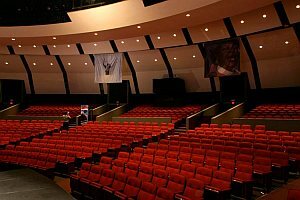 3,500-seat main concert hall named for Newark native Sarah Vaughan, also includes Newark Stage 200-seat black box theater used for theatrical productions, The Studio rehearsal space, and. The Dance Studio, one of three facilities in state used by school of the Garden State Ballet. Former home of New Jersey Symphony Orchestra, which relocated to New Jersey Performing Arts Center, now focuses on African American productions and music. Over its history, classical artists have included Arturo Toscanini, Vladimir Horowitz, Marian Anderson, William Warfield, Lily Pons and George Gershwin; Boston and Cleveland Symphony Orchestras and Ballet Russe de Monte Carlo; and popular singers and comedians such as Queen Latifah,Gladys Knight, the Temptations and Richard Pryor. Received 2016 Tony Award for regional theaters. On site of paper mill built in 1795, repertory theater opened in 1938, officially designated as "State Theater of New Jersey" by Governor William Cahill in 1972, suffered devastating fire in 1980, reopened 1982 after reconstruction. Features musical productions of past Broadway hits or new pre-Broadway tryouts, 2016 featured revival of West Side Story, Sponsors theatre school for both professionals and amateurs, alumni include Oscar-winning actress Anne Hathaway, voted "Favorite Place to Take an Arts Class" in New Jersey People's Choice Awards in 2016 survey by JerseyArts.com. 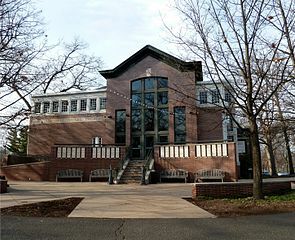 Founded 1992 in Montclair, became a professional theatre in 1995, relocated in 2010 to West Orange to building with 99-seat Black Box Mainstage Theatre; 45-seat Studio Theatre; and rehearsal room. Emphasis on developing and producing innovative works of emerging playwrights and revivals of contemporary and classic plays relevant to contemporary issues. Over its history, contributed to development of over 50 new works for stage, including world premieres later produced in New York and across country. Sponsors classes for children and adults and developmental programs for early career artists. Proscenium theater with seating for 300 inside turn-of-the-century brownstone church. Presents concerts, theatre productions, lectures and other events. Resident nonprofit theatre company 4th Wall Theatre focuses on performing lesser-known musicals and plays with ensemble casts. Origins in 1932 construction of Park Theater built to house a local parish’s presentation of “The Passion Play" profile of Christ, Center remains best known for its Passion Play annual productions. Park Performing Arts Center incorporated 1983 as non-profit arts center to present and produce programs for Hudson County’ audiences, only institution in County solely dedicated to performing arts. Also includes Northeast Folk Arts Center, classes and performances along with exhibits on Hudson County heritage and ethnic communities. Theaters on Union and Hillside campuses include 953-seat Wilkins Theatre; 312-seat concert venue, Gene and Shelley Enlow Recital Hall (Hillside campus); 318-seat STEM Auditorium; and 218 seat Little Theater. Kean also hosts resident Premiere Stages professional equity theater company which presents productions, play development programs, and educational initiatives, including Premiere Play Factory program introducing theater to thousands of children across New Jersey, School Time Residencies and Camp Premiere Summer youth program in playwriting. Premiere Artists program provides Kean students with professional training, credits toward union affiliation, paid positions as actors, assistants, and interns on Equity productions. International Film Series with award-winning modern foreign cinema presented annually in STEM Auditorium. Union Performing Arts Center non-profit organization which operates three theater venues. "Mainstage" theater with 1,334-seat capacity housed in restored “Rahway Theatre” first opened in 1928 as vaudeville theater and silent movie palace, theater still contains original Wurlitzer organ. Listed in both state and national registers of historic sites, now operates as multipurpose venue, including plays, music, dance. Rear second floor of building converted to "The Loft" black box performance space and rehearsal studio with seats ranging from 30 to 70, performances include live acoustic sets, jam sessions, stage plays, recitals and classes. "Hamilton Stage" opened 2012 as new 199-seat theater for plays, dance, music and film, hosts over 150 performances each year, also includes Fazioli Room rehearsal space with floor-to-ceiling conservatory windows and wall-length mirrors on one side, grand piano and drop-down screen and projector. Non-profit 120-seat community theater. Founded in 1918 as a World War I relief organization, theater in building originally constructed 1891 as Summit public library, began use as theater in 1918. One of oldest continuously operating community theaters in US. Produces three to four shows a year, Kaleidoscope Theater for Youth presents one to two productions for and with children and young adults. Centenary campus site of three theaters. Carol and David Lackland Center opened in 2010 with 22,000-square-foot performance space, includes 500-seat Sitnik Theater and 80 to 99-seat Edith Bolte Kutz ’42 black box theater, along with dance studio and rehearsal and support space. Separate Little Theatre in Seay Building, one of original buildings of school built 1900 and included on National Register and state registry of historic places, with theater first built as upper-floor chapel. Home of Centenary Stage Company professional Actors Equity regional theater operating for over 40 years includes Centenary theater students in stage and support roles. Productions include diverse musical, drama and comedy presentations. Founded 1933, one of oldest community theaters in state, presented over 300 plays and musicals. 100-seat theater. Produces five mainstage productions per season utilizing local actors, producers, directors, carpenters, lighting, set and costume designers and other volunteers. 2016 productions include "The Music Man," "Passion of Dracula," "The Miracle Worker." Built in 1937 as movie theater of Walter Reade’s chain in New Jersey. After closure in 1980s, vacant until local fundraising campaign and renovation as performing arts Community Theatre, reopened 1994 with performance by Kirov Orchestra of Saint Petersburg and Morristown resident and renowned pianist, Alexander Slobodyanik. Community Theatre renamed 2011 as Mayo Performing Arts Center. Over 200 performances to more than 200,000 patrons annually, $7 million capital campaign funded renovations including orchestra pit, state of the art fly-rail system, new dressing rooms, Art gallery, digital marquee and central air conditioning, as well as completion of Theatre’s suite of education studios for Performing Arts School classes for both children and adults. Also sponsors productions of student musicals. Located within Morris Museum. Professional theatre that produces plays, presents jazz and special concerts along with year-round children's theatre, holds performing arts classes for children to adults. Opened in 2005 on campus of Drew University with advocacy from then Drew President and former Governor Thomas H. Kean. 430-seat theater hosts about 90 public concerts and other events, including Chamber Music Society of Lincoln Center which conducts on-going series in the hall. Known for superior acoustics and site of many recording sessions, Hall’s da Camera concert series features musicians who have recorded in Concert Hall. Theater with just over 300 seats on campus of Drew University. Home since 1972 of Shakespeare Theatre of New Jersey, state's only professional theatre company dedicated to Shakespeare and other classic works. Founded 1963 in Cape May, now longest-running Shakespeare theatre on east coast. Main Stage season presented May through December, outdoor stage productions each summer at open-air The Greek Theatre amphitheatre on College of Saint Elizabeth campus in Morris Township. Founded 1986 as Playwrights Theatre of New Jersey, community of professional playwrights, theater artists and art educators to provide opportunities for writers to develop their works and connect with new audiences. Dedicated solely to development of new plays and writers for stage, presents over 25 new works annually in development process ranging from roundtable readings to full productions. Mainstage Productions brings two to three new plays per season to life in professional productions in New Jersey. New Play Program includes New Jersey Women Playwrights Program; Literary Artist Fellowship Program creates opportunities for professional writers through readings, workshops and productions with audience feedback; New Jersey Writers Project workshops led by professional writers-in-residence to students in schools and community centers; other programs include Poetry Out Loud, New Jersey Young Playwrights Contest and Festival, and Creative Arts Academy arts education for over 31,000 pre-K through adult students. Theater in structure originally built as synagogue and later acquired by Knights of Columbus as meeting hall, purchased 1977 by non-profit local community children's theater group Pax Amicus and converted to castle-like design through extensive renovation, cited as Outstanding Building of the Year by National Remodelers Association. Presently includes Castle Shakespeare Repertory professional acting company specializing in works of William Shakespeare, Edgar Allan Poe and other European and American playwrights; Magical Caravan Players professional acting company providing educational theatre for children; Pax Amicus Castle Community Theater community theater presenting contemporary comedies, dramas, and musicals with public casting calls; and Pax Amicus Generation Next program offering performers aged 13 to 19 opportunity to be directed by professional directors and choreographers on Pax Amicus stage. Located on campus of William Paterson University, theater opened 1967 and named after Dr. Marion B. Shea, second president of William Paterson State College, former name of University. 922-seat Shea Auditorium theater with open stage hosts lectures, concerts, dance other events. 80-seat Hunziker Black Box Theatre located across plaza hosts intimate theatre productions, small meetings, or other informal events may be configured for theatre-in-the round or other layouts. Sponsors annual summer jazz workshop program. Presents nearly 150 concerts, events and performances annually including classical, rock, dance and comedy. Focus on innovative arts. Originally built as movie theater which opened in 1926, closed in 1973, then re-opened as John Harms Center in 1976 after local impressario John Harms, renovation in 1990s to become modern concert hall and media facility with acclaimed acoustics utilized as performance and recording site. Harms Center closed in 2003 due to financial problems, subsequent public/private partnership raised funds for re-opening in 2004. Performing Arts School located in former recording studio, offers students training by industry professionals. Theater named after Becton family, principals of Becton-Dickinson medical device company and patrons of University. Hosts Garage Theatre Group, founded 1993, performed at various high schools and other sites until relocating 2003 to Becton Theatre. Produced 8 world premieres, and 6 New Jersey premieres, plays include those in development for off-Broadway productions, as well as regional productions across US. At conclusion of each professional performance, features discussion with cast, director and audience.